Griffin Technology Elevator - Desktop Stand for Portable Computers. Solid aluminum and acrylic construction! 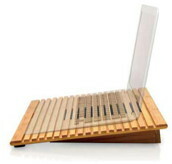 KB Covers Clear Keyboard 11"
KB Covers Clear Keyboard Cover for MacBook Air 11"
MacAlly Adjustable Bamboo cooling stand. Organic and eco-friendly bamboo material for a greener living lifestyle. Ultimate thermal solution to cool down your notebook. Compatible with any laptop under 17". NewerTech NuPad Leather 8.25" x 9" mouse pad. Black color. NewerTech NuPad Leather 6" x 9" mouse pad. Black color. 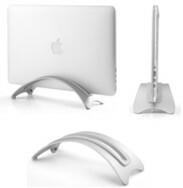 Newer Technology NuStand Alloy: Desktop Stand for Apple Mac mini 2010, 2011, or 2012 model. 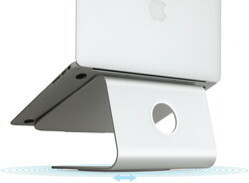 Sturdy aluminum alloy base elegantly holds your Mac mini for convenient use. Non-skid rubber feet for stable operation.